This sensor suite with standard radiation shield includes all the sensors you need-anemometer, rain collector, and temperature, humidity and solar irradiance-to measure solar energy potential or Evapotranspiration. Includes standard radiation shield which protects against solar radiation and other sources of radiated and reflected heat. 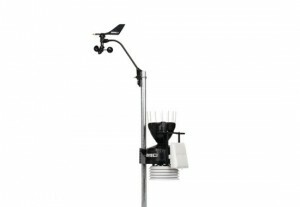 Detachable anemometer provides wind speed and direction and can be sited up to 12 m above the other sensors. Cabled transmission from the sensor suite to Cabled Vantage Connect, EnviroMonitor, a Cabled Vantage Pro2 console, or Cabled Weather Envoy.